Another variation on the 40W receiver theme, replacing Beomaster 2000. Many of same features were carried over, in particular the excellent directly coupled power amplifiers, capable of a large and accurate output. Text copyright © Beocentral. Unauthorised reproduction prohibited. Externally, the cabinet design offered a few points of interest. The left hand side of the top aluminium surface hinged up under damped control to reveal the minor controls (silent tuning, stereo/mono etc), tone and balanced sliders, and beneath a further snap-in cover, connection sockets. These sockets were horizontal, meaning that the plugs in them stood vertically. Special right-angled connectors were therefore needed to retain sufficient clearance for the lid to shut! Also under the main cover were 5 FM preset tuning dials of a new and interesting design. After years of fitting their top-line models with wretched little wheels that were very difficult to set properly (for example the otherwise excellent Beomaster 3000, though the outstanding AFC circuit on this series of models made up for this to a large extent), at last B&O provided a design of control that was both visually attractive and easy to adjust. Initially, all one saw were 5 little dials, marked at intervals with FM frequencies in megahertz. A glance at these quickly showed which FM preset key (there were 5) was set to which station. To adjust these, one pushed on the panel lightly, whereupon it would elevate, revealing a thumbwheel under each dial. A point that was greatly appreciated was that these were geared, making accurate setting very straightforward. Text copyright © Beocentral. Unauthorised reproduction prohibited. The manual tuning was also novel, 3 strip scales were provided on the front panel, nice and discreet to avoid spoiling the lines of the set. Only the one representing the waveband in use would illuminate, so they served as a waveband indicator too. Keys in the main switchbank selected FM or AM bands, and whilst in the AM mode pushing the large tuning wheel toggled between MW and LW. Text copyright © Beocentral. Unauthorised reproduction prohibited. So the Beomaster 2200 was neat, compact, elegant, easy to use and provided excellent results. None of this was unusual for B&O, but the way it was built inside certainly was. The basis was a resin “chassis” with a large number of raised tinned pins arranged in groups of lines. These were interconnected with what would normally be regarded as “prototyping” wire, thin and flexible, designed to be wrapped around the pins and soldered, whereupon the insulation would evaporate. This method was popular at the time for mocking up logic circuits, but is seldom seen in production equipment of any make. Onto this chassis was fitted another resin frame, moulded to hold the large number of PCB modules that made up the Beomaster. The circuit had been logically subdivided, so there were for example two power amplifiers, the rectifier and regulator, AM and FM front ends, stereo decoder, tone controls, sockets and RIAA stage, all physically separate and easily removable. Only heavy or large items (reservoir capacitors, mains transformer) and items attached to the control panel were mounted conventionally. Using a couple of screwdrivers, the whole thing could be reduced to its component parts in a matter of minutes. The reason for this novel method of construction is not clear, certainly by the time the Beomaster 2200 was introduced B&O had refined the art of making a reliable, stable product. The construction of it reflected the current practice in TV construction (for example the then-new 33XX series) which were often serviced by module replacement. Text copyright © Beocentral. Unauthorised reproduction prohibited. The Beomaster 2200 formed the basis for a range of quality music centres, and it is in the form of the Beocenter 3300 that it is best known. Beocenter 3300 has a turntable, but there is also a cassette version, Beocenter 4000. 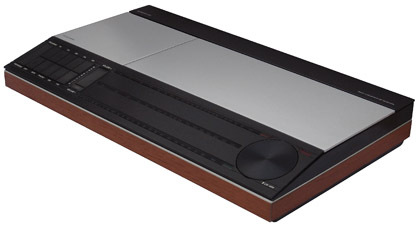 Even though the turntable and cassette deck were mounted on opposite ends of the receiver chassis, a model with both sources was sadly never made. Text copyright © Beocentral. Unauthorised reproduction prohibited.